At My Hearing Centers, we believe in client-centered care. We want you to have the best hearing experience and spend time with your family and friends rather than worrying about your hearing aids, struggling with settings, or being nervous about running out of power. That’s why we have a one-time offer for free batteries! Whatever hearing aid you’re using, and whatever your power requirements, we have the batteries you need for clear hearing. Offering a range of sizes, including 312, 13, 10, and 675 size batteries, we’ll have you hearing in no time. Batteries are the one big ongoing purchase for hearing aid wearers, so you need to know what batteries you need, and how they work. 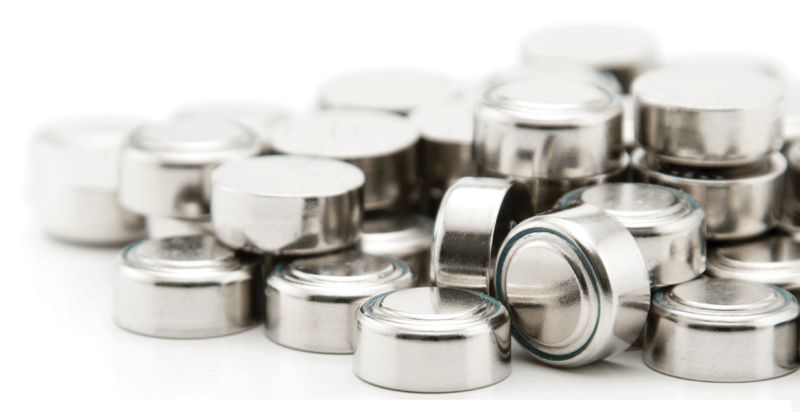 The most common type of hearing aid battery is the zinc disposable battery, that are activated by the air. All batteries come with an air-tight sticker, so the battery stays inactive until you pull that sticker off to put them into your hearing aids. Once you’ve removed the sticker, the oxygen in the air will interact with the zinc, creating power for your device. Putting the sticker back on doesn’t deactivate the battery, so make sure you only remove the sticker when you’re ready to put them into your hearing aids. Hearing aid batteries last between 3 to 14 days, with smaller batteries having a shorter life. How long a battery lasts depends on your level of hearing loss and how much power you use. Battery life is also affected by how many hours per day you’re wearing your device. Hearing aid batteries come in a range of sizes, to match the power needs and size of each hearing aid. More powerful hearing aids need larger batteries. These devices are great for people who are running lots of advanced features, or for those with more severe hearing loss. There are four main sizes of hearing aid batteries, but they’re all very small. Even the largest battery is smaller than a dime. 675: The most powerful battery out there is size 675. These batteries have a blue label, and are usually found in behind-the-ear hearing aid models. They have the longest battery life, since they’re big enough to pack a lot of punch. 13: Size 13 batteries come with a bright orange label for easy identification. They’re the second strongest battery, so you find them in some Behind the Ear Models as well. Most commonly, they are worn in in-the-ear hearing aids. 312: These batteries have a moderate battery life, and are one of the most common battery sizes. This is because most receiver-in-canal and in-the-ear hearing aids use this size. Just look for the brown label. 10: Size 10 is one of the smallest hearing aid batteries out there, measuring just 5.8mm by 3.6 mm. These batteries come with a yellow label, and have the shortest battery life. They’re found in small hearing aids, like the completely-in-canal models. If you want to get the most out of your batteries, there are a few simple steps you can take. Always turn your hearing aids off at night, and open the battery door to dry any condensation that might have accumulated on the battery overnight. Never store your batteries in the fridge. Zinc batteries will last on the shelf for up the 3 years, and putting them in the fridge doesn’t prolong their life. In fact, it could wreck your batteries if any moisture or condensation gets under the sticker seal. Finally, keep your old batteries and recycle them to keep batteries out of landfills. Whether you’re new to hearing aids, or have been wearing hearing devices for a long time, visit us at the nearest My Hearing Centers location to talk to our friendly team of hearing specialists. We’re here to help you choose the best hearing aid to suit your needs and lifestyle, or help you with maintenance on your current devices. If you want to take advantage of this one-time offer for free batteries, don’t wait! Limited to one per person, let us give you the gift of hearing. Come pick up your free batteries today!